Erfworld is a fictional location where the main story of the Erfworld webcomic takes place. The inhabitants (called units) , with few exceptions, are constantly at war with breaks only to rebuild and re-arm. The geography of Erfworld resembles that of our Real World, Earth. It includes mountains, seas, forests, lakes, and hills (see Terrain Type). Erfworld is illuminated by a sun during the dayErf-b1-p007 and a moon and stars during the nightErf-b1-p035 . It is unknown if the stellar system is geocentric or heliocentric, or even if Erfworld is in fact round. Clouds and rain occur on Erfworld. 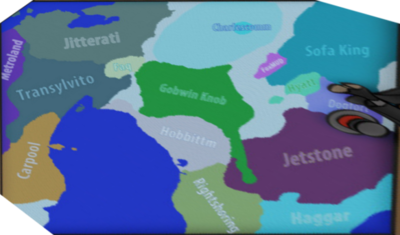 The people of Erfworld come from a variety of fantasy sources -- men, elves, gobwins, vampires, and many more species. Erfworld also includes fantastic monsters, such as dwagons and gwiffons that, despite cute names and appearances, are dangerous and violent. Timeline of Erfworld lists known dates of historical events. A great many things are discrete in Erfworld that are continuous in ours. Unit's stats are always whole numbers. Terrain is divided into hexagonal areas that have their own weather, time and specific type, for example they can be either a regular mountain or a high mountain, never anything in between. Nature itself acts much as it does on Earth. People (known as Units) are governed by a complex set of rules not enforced on Earth. To learn the known (and speculative) rules that govern Erfworld, visit Erfworld Mechanics. Many of these rules are similar to what one might find in a Real World turn-based strategy game, but combat itself occurs in real-time. Magic is real in Erfworld. Some people can cast spells which affect the world in ways denied by Science in the Real World. While most people that can cast spells are Casters, others can cast spells naturally. Magic can harm people, control them, create non-living creatures, and do many other things. Seasons have not been mentioned. The length of day is usually 24 hours, but time passes in an odd relative way, depending upon the zone from which one is observing. Erfworld probably includes all terrain that Earth has. Erfworld draws inspiration from the game Warlords III. This page was last edited on 14 April 2018, at 11:00.